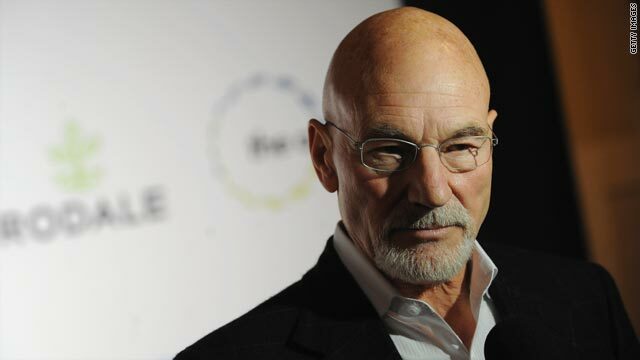 Actor Patrick Stewart -- a 69-year-old Yorkshire, England, native -- tops the list of those receiving New Year's honors. Patrick Stewart played Capt. Jean-Luc Picard on "Star Trek: The Next Generation"
London, England (CNN) -- He has played kings, princes, captains and professors on stage and screen, but now actor Patrick Stewart will have a new title all his own: "Sir." The 69-year-old Yorkshire, England, native tops the list of those receiving New Year's honors from Britain's Queen Elizabeth II, the Cabinet Office announced Thursday. Stewart, well-known for playing Capt. Jean-Luc Picard on "Star Trek: The Next Generation," will receive a knighthood. It means he will now be known in Britain as "Sir Patrick." Others on the list include designers, restaurateurs and two famous names from Formula 1 racing. Ross Brawn, who started the Brawn GP Formula 1 team that won the constructors championship in 2009, will receive an OBE, which stands for Officer of the Order of the British Empire. Brawn started his eponymous team this year after buying out the existing Honda team. Mercedes-Benz took over the team last month, announcing that Brawn would remain at the helm and that the team would be renamed Mercedes GP. Jenson Button, who won the 2009 Formula 1 drivers championship, will receive an MBE, or Member of the Order of the British Empire. He races with the Brawn-Mercedes team. The 2008 F1 champion, Lewis Hamilton, received an MBE last year. British designer Amanda Wakeley, whose designs grace models on the catwalk and celebrities on the red carpet, will receive an OBE. Two other British designers will receive MBEs. Cath Kidston is known for putting traditional floral prints on modern accessories, and Luella Bartley was hailed for mixing prim and punk before her label was forced to close last month. Also receiving an MBE are Rose Gray and Ruth Rogers, who together started the River Cafe in London, along the Thames. Their passion for Italian cuisine has led critics to call the restaurant one of the most influential in Britain, and the two have written several cookbooks together. A committee within the British Cabinet Office assembles the honors list, which is released twice a year -- at New Year's and on the queen's birthday in June. Queen Elizabeth awards the honors to recipients in ceremonies at Buckingham Palace. The awards recognize service and achievement in all fields and are considered a major honor for British citizens. Noncitizens may also be recognized. A knighthood is the highest honor. Men are made knights, after which they are called "sirs," and women are made dames. Below that comes CBE, which stands for Commander of the Order of the British Empire. OBE and MBE follow respectively.